When I set a goal back at the beginning of the year to be more active, part of that goal was to get back to where I was when I was training for the marathon a few years back to be able to run 3 to 5 miles a few times a week. At the time of that post, I had done very little cardio for the previous 6 months besides a few random times playing basketball. In an effort to give ourselves an exercise-related goal to shoot for, Joyce and I signed up for the Brooklyn Half Marathon in the middle of May a few months back. After reading Born to Run, we wanted to try out barefoot running as we start up running again. The last couple of months I’ve been slowly trying to get my feet adjusted to the concept of barefoot running. I did quite a bit of reading online about making the transition, namely to take it very easy to start and to avoid heel striking. The potential upside in converting involves fixing the biometrics of your body and strengthening muscles in my legs that have been babied by shoes my whole life. Part of the allure of switching to barefoot running was that I ended up training for and running the Chicago Marathon via heel striking. At the time, being unaware that it was not good for my knees, I noticed that it was significantly easier on my calves than the forefoot striking that I started out with, so I switched over to it during my training (which I imagine is part of the reason most people run this way). There have been some reports that a large majority of newer runners heel strike, and its not a natural motion for your body. About halfway through the marathon, my right knee started to feel a bit loose due to my running on the curved side of the streets to avoid crowds (fortunately the only injury I sustained in the race or the training leading up to it), and I ended up running about 10 miles on that injury to finish, which I ended up resting for a month or two before running again. I still have no idea whether my shoes had anything to do with it, but considering most runners get injured on a semi-frequent basis, I figured I was incredibly lucky up until then and shouldn’t continue to expect it to keep up. 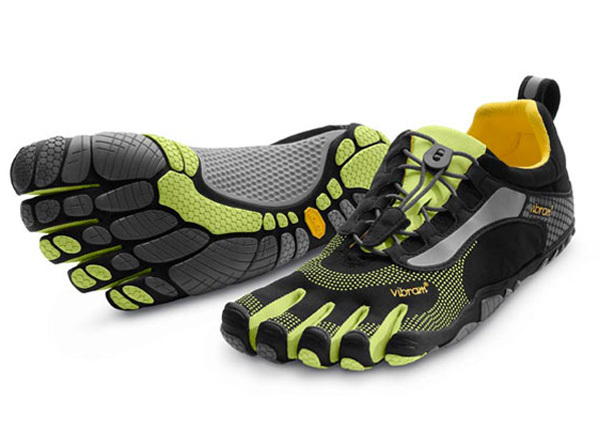 Since actually running barefoot seems like a great way to step on glass or rip apart your feet in the city, I decided to try out Vibram Fivefingers, which a bunch of people in the running community have been trying out. I had already acquired a pair of the Bikila LS version of the shoe 3+ years ago primarily because I was intrigued by the concept of shoes with individual toes (completely unaware of any biometric benefits). I wore them to work and walking around here and there, but never really tried to run in them. Part of the issue was that I did run to the bus stop once in them, but as a heel striker at the time hurt my right leg a bit heel striking almost directly on pavement (no padding in these shoes). In hindsight, I think I developed a minor stress fracture, but at the time I had no idea my form was the reason. At some point, the fad wore off and they became a closet item. Fortunately I kept them during the move to NYC, and now had them ready to go. Joyce ended up getting her pair for Christmas, and we slowly started in January (in between the snowfalls around where we live that don’t get cleaned up until they melt on their own). We started out with very short runs, less than half a mile, and very slowly started moving up. One of the frustrating pieces to me was (and still remains) the fact that I’m running much lower mileage and speeds than I know I’m capable of in an effort to strengthen my legs, and as such my upper body doesn’t get the cardio workout I’d like yet. On the plus side, I’m finding it interesting to see how changes in my form fix ailments I feel. As I mentioned, with heel striking and heel raised running shoes, my calves didn’t get all that much of a workout. When I started out, I was extremely afraid of heel striking, so I overcompensated by essentially never letting my heels touch the ground. Needless to say, running a mile only letting the balls of your feet hit the ground was a bit of a shock to my calves. Slowly I’ve gotten better about midfoot striking and letting my heels gently touch the ground, but I’m still not at a point where my form is perfect. Another example the other day was while running 5 miles (our longest distance yet), where I lamented to Joyce that my calves kept getting sore after only a mile. She noticed that my feet were dragging a bit when running lately, and that my calves were doing all the work. After I started making an effort to leverage my quads more while striding, my calves quickly loosened up. Presumably these same changes are also noticeable running with solid form in normal running shoes, but it has taken me wearing minimalist shoes to really open my eyes. I still get frustrated about the restrictions I place on myself at this point, but I’m still really hopeful that I’ll be able to keep adjusting and finish that half marathon in Vibram Fivefingers.